What is fluorescence anisotropy or fluorescence polarization? What are luminescence quantum yields? What is an excitation emission matrix (EEM)? The term fluorescence refers to one type of luminescence. Luminescence, broadly defined, is light emission from a molecule. There are several types of luminescence. Photoluminescence is when light energy, or photons, stimulate the emission of a photon. Chemiluminescence, is defined as when chemical energy stimulates the emission of a photon, and this includes bioluminescence, as seen in fire flies and many forms of sea life. Electroluminescence, is when electrical energy or a strong electric field, stimulates the emission of a photon, such as in some lighting applications. Fluorescence, specifically, is a type of photoluminescence where light raises an electron to an excited state. The excited state undergoes rapid thermal energy loss to the environment through vibrations, and then a photon is emitted from the lowest-lying singlet exited state. This process of photon emission competes for other non-radiative processes including energy transfer and heat loss. When the term “fluorescence” is used, the same methods of measurement can typically be applied to any of the above categories of luminescence. What is a Fluorescence Spectrum? Steady state fluorescence spectra are when molecules, excited by a constant source of light, emit fluorescence, and the emitted photons, or intensity, are detected as a function of wavelength. A fluorescence emission spectrum is when the excitation wavelength is fixed and the emission wavelength is scanned to get a plot of intensity vs. emission wavelength. A fluorescence excitation spectrum is when the emission wavelength is fixed and the excitation monochromator wavelength is scanned. In this way, the spectrum gives information about the wavelengths at which a sample will absorb so as to emit at the single emission wavelength chosen for observation. It is analogous to absorbance spectrum, but is a much more sensitive technique in terms of limits of detection and molecular specificity. Excitation spectra are specific to a single emitting wavelength/species as opposed to an absorbance spectrum, which measures all absorbing species in a solution or sample. The emission and excitation spectra for a given fluorophore are mirror images of each other. Typically, the emission spectrum occurs at higher wavelengths (lower energy) than the excitation or absorbance spectrum. These two spectral types (emission and excitation) are used to see how a sample is changing. The spectral intensity and or peak wavelength may change with variants such as temperature, concentration, or interactions with other molecules around it. This includes quencher molecules and molecules or materials that involve energy transfer. Some fluorophores are also sensitive to solvent environment properties such as pH, polarity, and certain ion concentrations. What types of molecules and materials exhibit fluorescence? Fluorescent molecules and materials come in all shapes and sizes. Some are intrinsically fluorescent, such as chlorophyll and the amino acid residue tryptophan (Trp), phenylalanine (Phe) and tyrosine (Tyr). Others are molecules synthesized specifically as stable organic dyes or tags to be added to otherwise non-fluorescent systems. There are entire catalogs of these available. Typically, organic fluorescent molecules have aromatic rings and pi-conjugated electrons in them. Depending on their size and structure, organic dyes can emit from the UV out into the near-IR. Here are a random sampling of a few common fluorophores that span the UV and Visible range. Some rare earth elements, or lanthanides, have higher electronic orbitals filled, where electrons transition due to metal ligand charge transfers happen between 4f-5d and even 4f-4f orbitals. (Bunzli, 1989) There are many molecules that are luminescent in nature such as a few of the amino acids, chlorophylls, and natural pigments. Others are highly engineered for very specific uses of fluorescence spectroscopy. Other molecules and materials such as fluorescent proteins, semiconductors, phosphors, and rare earth elements are among the commonly used fluorescent samples. Polymers with conjugated aromatics or dienes also commonly have fluorescent properties. Of course, new materials are being created all the time. 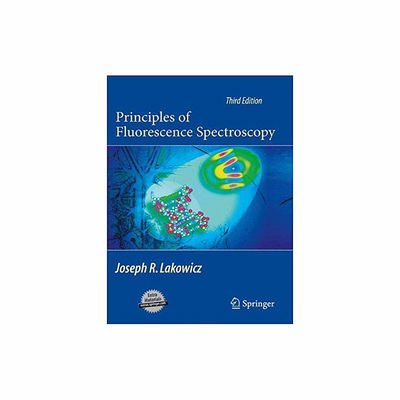 For the most comprehensive book on Fluorescence Spectroscopy please read Dr. Joseph Lakowicz’s book, Principles of Fluorescence Spectroscopy, third edition.